Feckin unbelievable....it just goes to show that just anyone can be a reporter/critic on music! Highly influenced by the Prodigy, Sparks hit the world in 1997 with "Balls," an album rife with huge breakbeats and industrial sounds. Sparks emerged in 77, 20 years before that spotty twerp wrote that article! Apparantly they've been putting out albums since 1971 (assuming this source can be trusted ) and I didn't even discover their music until this year! Your point regarding journalistic sloppiness is well taken, it's especially the case in this day and age of 'instant publishing' on the Internet with everyone having a blog. unbelievable! class! icons! undersold! exclamation marks! I think he means that the 'Balls' album of 1997 was influenced by The Prodigy, rather than Sparks were influenced by The Prodigy when they started out. 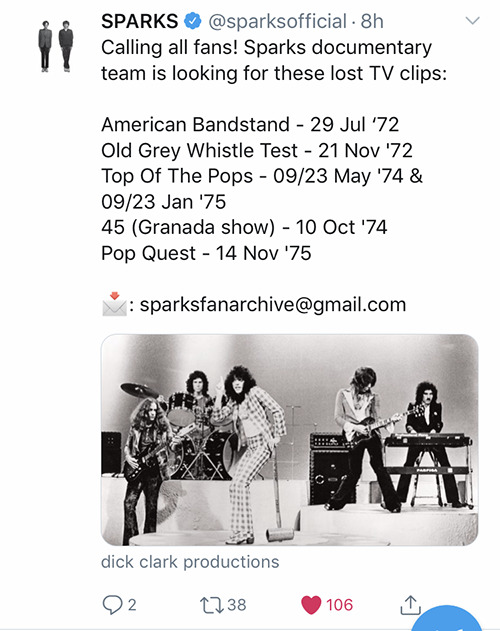 If you scroll down you will see that he talks about all the shows, going back to their performance of their debut album 'Half Nelson' of 1971. 'Jack will show you to your room. I have given you the room in the tower'. I've followed their career since 'This Town Ain't Big Enough' - loved that they were 'different' and still are! Putting this in an old thread, rather than creating a new one. I'm sure Johnofdeath would approve.